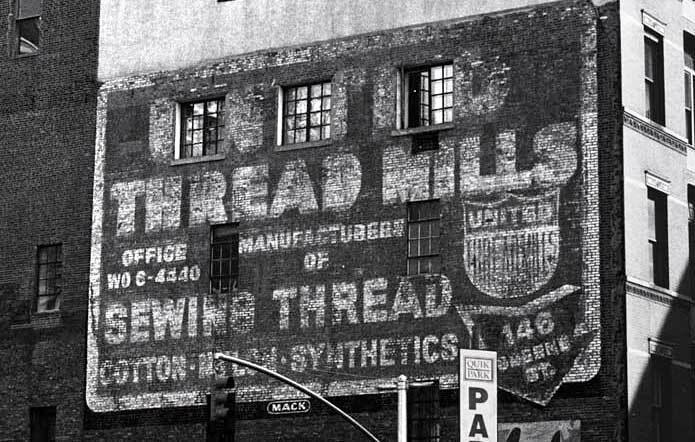 United Thread Mills manufactured sewing thread in a textile mill in this builing at 146 Greene St. from 1962 to 1982. The company was originally located at 656 Broadway from 1942 until 1949, then at 54 Bleecker St. from 1949 to 1962. The sign was considerably mutilated in the late 1990's by a watch manufacturer. Click here for 2002 image. The words "United" and "Mills" are no longer visible. And the arrow in the lower right corner pointing to 146 Greene St. has become very indistinct. The earlier image shows these features more clearly. Even here "United" is indistinct since windows were punched through this part of the sign. In 1982 United Thread Mills left their Greene St. location and moved to Rockville Centre, Long Island. This sign was painted by Bob Middleton and Joseph Piscitelli of Mack Sign Co. between 1965 and 1969. Piscitelli left Mack Sign Co. in 1970.